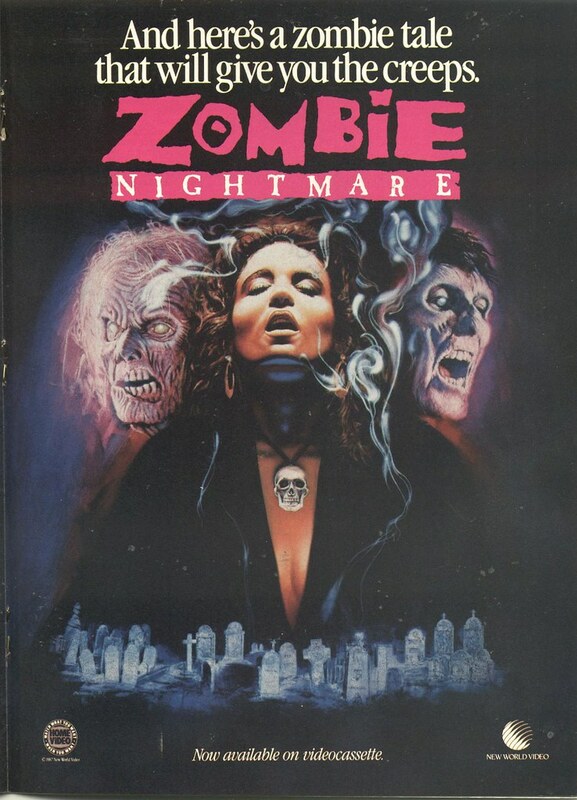 Today, I’m showing you a 1987 home video ad for Zombie Nightmare (1991) starring Adam West, Jon-Mikl Thor, Tia Carrere and Shawn Levy. This ad was on the back cover of one of my Fangoria’s and I’ve always loved the look of it. I’m surprised it doesn’t mention that Adam West and Tia Carrere star in it (well, to say they “star” in it is sort of an overstatement). I’ve never seen the movie, but I’ve chosen it as tomorrow’s Fangoria Movie Friday review. So buckle your seat belts, I think it could be a bumpy ride. This entry was posted on October 23, 2014 at 8:00 am and is filed under Fangoria, Genres, Halloween, holiday, horror, magazine, movies, nostalgia, pop culture with tags AWESOME-tober-fest, AWESOME-tober-fest 2014, Fangoria, Halloween, magazines, movies, nostalgia. You can follow any responses to this entry through the RSS 2.0 feed. You can skip to the end and leave a response. Pinging is currently not allowed.